1. The show has finally found it's host. Alyssa Milano works so much better than the people they've had before. 2. I don't know who to cheer for. So many of my favorites are here, Seth Aaron, Jeffrey, Korto and so many more. Lets hope these makes for awesome fashion. 3. The first challenge was punk, which seemed perfect for this cast. There were some great looks, but nothing totally blew me away. Also I was pulling for Seth Aaron or Jeffery to win. Click through the first week's looks. Which is your favorite? Also, what do you think of the new season of Project Runway All Stars? 1. This season had some of the best challenges in recent Runway history. 2. I love the addition of the Tim Gunn save and allowing Tim to sit alongside the judges offering perspective. The show has needed this for a while. 3. Zac Posen is kind of growing on me, but I still miss Michael. Heidi, however, has become a much stronger and more assertive. 4. Bradon was a favorite of mine all season, but I wasn't impressed by his collection or any pieces in it. I'm not sure what went wrong. In fact, I couldn't remember anything from his collection after the show ended. (Click through his collection below). 5. My least favorite moments from season 12 were Sandro and Ken. Stunning gowns and chic suits are nice but admit it. Your favorite part about fashion week is the outlandishly ugly, mind-numbingly horrible horrors. Brace yourself for the click through. Without intending to, I purchased a lot of mint this spring and summer. That's a very seasonal color, so how do I work it into my fall wardrobe? Well, it sort of depends on how much mint is involved. Use one color-neutral like burgundy or navy with a primary base of a basic neutral like taupe. Then the mint is a fresh pop. This is a similar idea using basic neutrals as the base, mint as the primary color, and another bright color as an accent. Copper is the metallic for fall, and some minty shades work perfectly as aged copper. You could go 80s-tastic by pairing mint with bold bubblegum pink. Just leave the acid wash and scrunchies in the past. Of course, you can always try it with a traditional fall palette. People have told me they find it odd that I wear red (or bright pink) lipstick nearly everyday. "Noticeable lipstick isn't for the workplace," so say people who aren't my boss (who doesn't care). While shopping for eyeliner the other day, I came across several women discussing whether or not black eyeliner was too much makeup for anything other than a dimly lit date. (As one of my New Year's fashion goals this year was to master winged liner, I took an interest in this.) They decided that anything darker than brown or a light grey was just too sultry for the office. Verdict: with my retro eyes and bold lips, people think I wear too much make up for an everyday daytime look. Mind you, I could spend 20 minutes applying concealer, highlighter, and bronzer for an airbrushed contour look, and that would be okay as long as my lips weren't a color and my eye makeup was brown. Project Runway All Stars Season 3 starts this week. We've got several winners in the mix like Seth Aaron, Irena and Jeffery. We also have some old favorites like Korto. Who are you cheering for? Why We Love It: If you've learned anything about Fashion Me Fabulous, you've probably learned that we are nerds. When Jael and I traveled to Japan for a friends wedding last year, I dragged her to the Pokemon Center where I ran around in a gleeful Pokemon stooper. I love Pokemon. And with the new game out, I can't walk past an electronics department at any store without contemplating my need for a 3DS and the new Pokemon X. 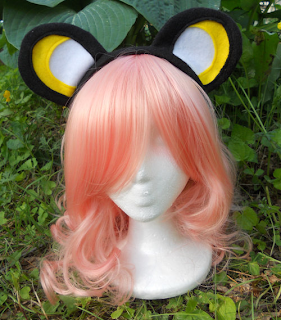 Maybe I could sate my Pocket Monster craving by being an Emolga for Halloween. (Click through the slideshow below to see some of our favorite items). It is a stereotype that women love shoes and have too many pairs. I choose to embrace this stereotype. becca and I are crazy for shoes both to wear and to ogle like objects of art. Jewelry ranks next. Sparkly, shiny, dainty, chunky -- doesn't matter; it should be added to our wardrobe. We both love a classic purse that you can fit a hardcover in. Sunglasses are an object of fantasy lust for this bespectacled blogger. Hmm, I feel like I've just listened to stirring love poetry. I love you, accessories. I love you two galleries worth. Some seasons are dominated by a certain time period. Since Mad Men came into popularity a few years ago, that time period is usually the 60s. I was actually expecting a bit more flapper style because of the success of The Great Gatsby, but not a single designer took the bait. In fact, very few designers looked back for Spring Summer 2014. The one exception was that bikinis looked more 50s with pretty prints and full-coverage bottoms than any sort of stringy cut-out trend of late. While retro was not the story of the season, we still love the classics. For months, I've been saving Halloween costume ideas. What I desperately want to be this year is a snapshot of a flapper; so, your usual flapper outfit, but all in black and white with elaborate contrast makeup. The picture to the right is similar but a different time period. Isn't it sort of jarring? Unfortunately, I am both short on time and money this year, so I think I will just embrace my inner goth with a borrowed wig and clothing I already own. This doesn't mean you can't use my months of costume gathering. A yurei is a Japanese ghost. You can achieve this look with a white robe (or sheet), a wide black sash, khol rimmed eyes and red eye shadow, and red coming from your sleeves. This fashion editorial is great inspiration. 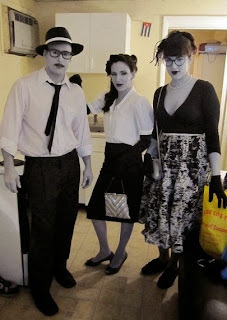 We've posted the Lichtenstein Comic Girl before, but since then I've actually worn this costume. Everyone asked if I was the measles. That's the day I learned Indiana hates art, so consider your audience. This one is just creepy. 1. I love the home visits because this is the Tim episode. However, I'm sad that we don't get time with Tim like we used to. Now that designers always have to come back to compete for their spots, we don't get to see a whole day of strange family activities were Tim has to learn to make strange new cuisine or something. 2. Justin has a 3D printer. Look at the cool stuff he made with a printer! His use of technology was awesome. 3. I want to design a line of basic dresses that come with a disk full of thousands of printable add-ons. You can pick the ones you want to print and wear. Someday, when everyone has a 3D printer, this will be all the rage. 4. Dom had a guaranteed spot at fashion week so she didn't have to show, but what we saw so far was pretty cool. Her unconventional materials piece was shaping up nicely too. 5. Tim was bloodied at one point after an altercation with the subway stairs. The stairs won, and Tim ended up with stitches. Why We Love It: It's sweater weather. Finally. I love this time of year. I love cuddling up in boots and leggings and sweaters and scarves and jackets. I can't get enough. Sadly, many of the sweaters and sweatshirts I find in stores are terribly boring. This Etsy shop has the answer. These sweatshirt sweaters are cozy, cute and perfect for the even colder days coming. (Also, considering what Anthropologie charges for something like this, the prices aren't bad). It's 40 in the morning and nearly 70 in the afternoon. This is the perfect weather for short-sleeved sweaters. Skirts and dresses are far more desirable than pants. I prefer loose skirts to fitted skirts. Shorts are dead to me. Waist definition is very important.I have am weak for stripes and polka dots.I'm a wardrobe chameleon. Click through to see my entire imaginary closet. See anything you want to borrow? More Fashion Week to come! 1. Heidi's line of the night: "That sausage is dangling right in front of your nose right now. Or is it a carrot? I'm German, I like sausages better." 3. Avant Garde challenge! I love the Avant Garde challenges, and I'm thrilled that this one was to be inspired by butterflies. 4. I also really enjoyed this twist to this challenge. The designers had to choose a loosing look to remix. The most interesting choice was Justin's who took on the look that got him eliminated before Tim saved him. It ended up being very emotional for him, and I'm glad he conquered that dress. 5. I loved Dom's looks. She was worried about using too many prints, and Tim set her free to do as she pleased. I'm glad she did it. This is vibrant and fun. Also, she fixed Jeremy's mumsy look and turned it into something really cool. Dom is headed to fashion week (and she's my frontrunner for the win right now). Why We Love It: I was admiring some designer shoes in a shop window this week. They were very cool, but for boots they were not the least bit functional. I love a cool shoe, but I prefer a cool shoe I can actually wear. Anat Dahari, the designer behind Walk, is an architect who designs shoes with simple yet exquisite form that serves their function. These are not your grandmother's comfort shoes. 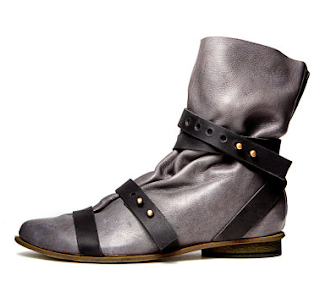 These have a lot of style to go with their substance. 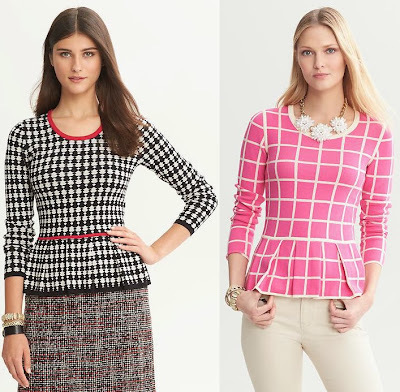 Banana Republic is currently selling two indomitably preppy peplum sweaters. I've been buying lots of peplums lately as they are figure flattering, especially went I don't want the burrito I had for lunch to prompt people to pregnancy questions. (I bloat, people. Back off!) The black and white one with pink trim is more versatile, but I love the strong grid on the bubblegum pink one. Bonus, they are both cotton and machine washable. At $80, I will be watching for these to go on sale. Between these two, which one is your pick of the week? The big beauty story played out across every city -- from Philip Lim to Lanvin, from Pucci to Chloé -- was nothing. Clean skin, maybe a bit of lip gloss, brushed eye brows, air-dried hair. While that may be easy-peasy, it's also super boring for a drama lover like myself. Give me a good brick lip or cobalt cateye. Give me a sleek ponytail or pin-up curls. Don't pay a team of professionals to make the models look like they just stepped out of the shower. Boring! My one bright spot of hope was the heavy use of metallics for those who did deign to makeup. Whether is was on nails, eyes, eyebrows, or hair, metallics are this upcoming spring's bright spot. Shiny. These days of 50 degree mornings and afternoons in the 80s are messing with me. Dressing before coffee is hard enough, but now I have to to temperature math. To help, I styled some layered outfits for inspiration. Time to break out the hats, the tights, the warmers for both arms and legs, the long sleeved tees, the scarves, and the cardigans. It's layering season. 1. The textile challenge is one of my favorites. 2. However, this episode really made me sad/mad (smad? no, that's not going to happen). 3. Heidi wore a cool print for the print challenge. I actually kind of want that shirt. Overall, Heidi has been dressing better this season. Right? 5. Dom won and totally deserved it. Not only did she design a great print, but she also created something cool with it. 6. Bradon's jacket was cool, but I think he kind of underwhelmed me with this look. 7. I don't know if Helen is that annoying to work near or if it was just the editing, but she produced a pretty cool look either way. I don't care for her print, but I think she made it work (as Tim would say). 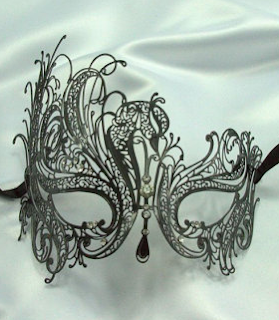 Why We Love It: I'm going to a masquerade party in November. I was originally going to make a mask, but then I found ElegantxBoutique, which makes stunning metal masks. Many are only $26--a steal in my book. Now my only problem is picking one. (Click through the slideshow to see some favorite items). Cameron Russell is a model. She spoke at TED about the power of image. She also tried to honestly answer some of the questions she has been asked as a model. This talk is far from perfect with a few shaky claims and a scattered feel, but she has interesting things to say both about admitting how powerful image can be and how image can be constructed. Mostly importantly, she drives home that thinner thighs and shinier hair don't add up to happiness and that there is more to aspire to than an image. What did you think of Cameron's talk?